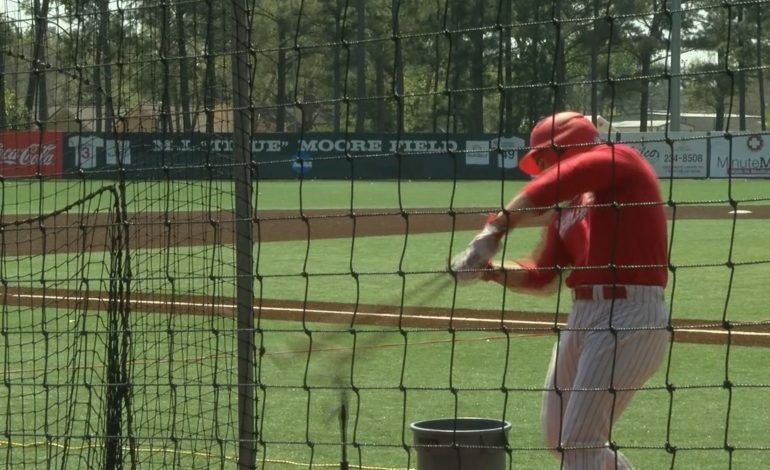 LAFAYETTE – Riding hot bats and stellar outings by both its starters and its bullpen, the Louisiana Baseball team put together two complete performances to claim victories of 14-5 and 6-1 in Saturday’s doubleheader to clinch the weekend series over Arkansas State. Louisiana (17-17, 6-6) was firing on all cylinders throughout Saturday’s doubleheader, outscoring Arkansas State, 20-6, and outhitting the Red Wolves, 21-12. The Ragin’ Cajuns’ pitching staff was also on fire, fanning 22 batters across the two games. Senior Handsome Monica was one of three Ragin’ Cajuns to record four hits on Saturday, including two home runs in Game One, and scored a team-high six runs along with three RBI. O’Neal Lochridge broke out of his slump with four hits, three of which came in the first contest, while Hayden Cantrelle also tacked on four hits, including his eighth home run of the year. Tremaine Spears finished the game with two hits and recorded a team-best four RBI. The Ragin’ Cajuns saw two quality starts on Saturday, the first coming from Austin Perrin, who pitched 7.0 innings of three-hit, no-run baseball with six strikeouts. That start was followed up by Brandon Young, who fanned 13 batters, the most since Austin Robichaux struck out 14 batters at Little Rock on April 12, 2013, and allowed just one run on four hits in 7.0 innings of action. Both Perrin and Young took the wins. Things got going in the third when Lott scored Cantrelle via a sacrifice fly and Monica blasted his first of two homers on the day to take its first lead at 2-0. That margin doubled in the next inning with a Lochridge single and a Cantrelle groundout to put the Ragin’ Cajuns in a comfortable spot. An insurance run in the sixth, backed by Young’s stellar start and a solid 1.0 inning apiece for Caleb Armstrong and Gunner Leger secured a 6-1 win and a series victory for the Ragin’ Cajuns.